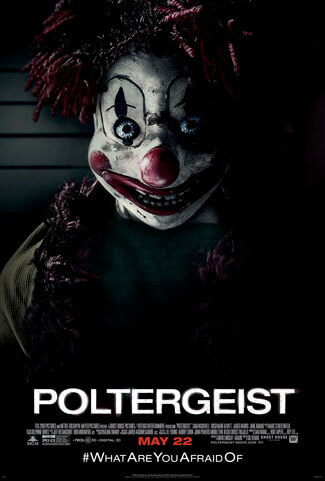 Trailer #2 for the remake of Poltergeist shows just how faithful the filmmakers of this 2015 version are keeping to the original movie. The 1982 horror hit had Craig T. Nelson and JoBeth Williams as parents who move their kids into a new development only to discover it’s smack dab on top of a cemetery. The 2015 Poltergeist finds Sam Rockwell and Rosemarie DeWitt taking on those roles with Gil Kenan directing (Tobe Hooper directed the ’82 film). Filmmaker Sam Raimi (Spider-Man, Evil Dead, The Grudge) and director Gil Kenan (Monster House) contemporize the classic tale about a family whose suburban home is haunted by evil forces. When the terrifying apparitions escalate their attacks and hold the youngest daughter captive, the family must come together to rescue her before she disappears forever.